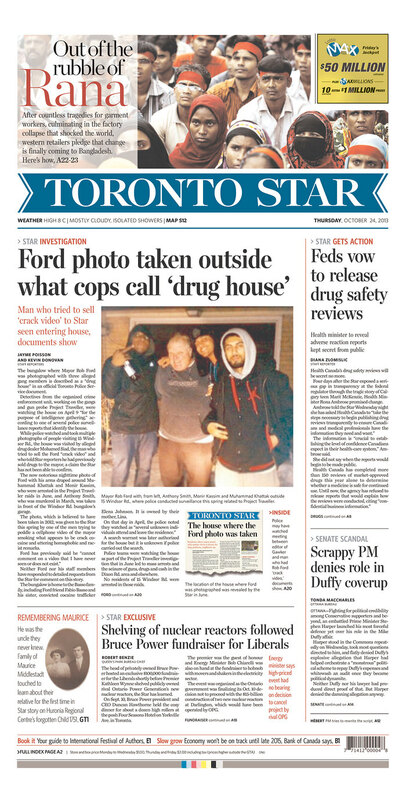 As the RRJ wrote in 2010, these brag-tags have spiked in frequency under editor-in-chief Michael Cooke, and have been a hallmark of the paper’s coverage of Rob Ford’s mayoralty (Tom Scocca of Deadspin was unimpressed when the paper labeled its first “crack video” story an exclusive). Cooke didn’t invent the label, nor is the Star the only one to use it, but the paper has a long history of promoting its stories on A1. 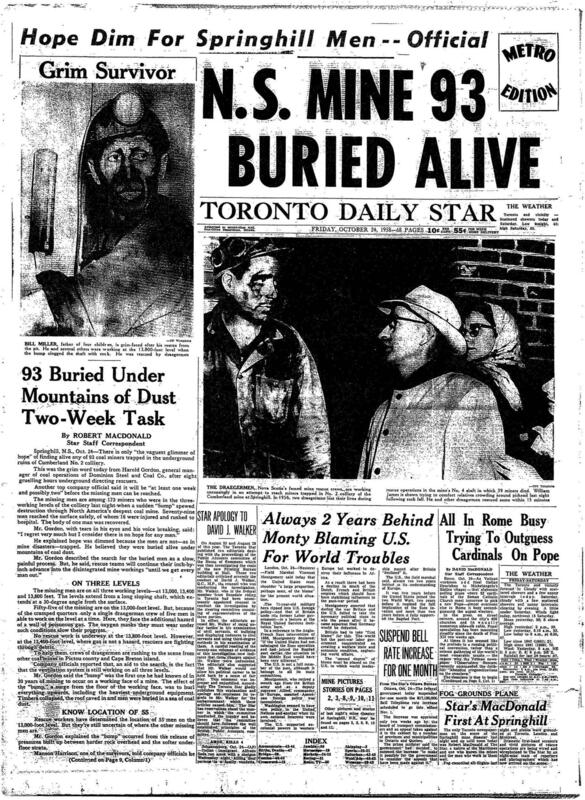 While not an exclusive (Canadian Press, CBC and, presumably, local media in Nova Scotia also had the story), the Star still felt it necessary to note that Robert MacDonald was “the only Toronto newspaper man on the scene of the Springhill mine disaster” and that he “knows the mines and the men who work in them well.” That was not to say that the other Toronto papers couldn’t cover the story; The Globe and Mail’s front page that day included three stories on Springhill: one from the wires, one from Toronto (about two locals who had relatives in the mine) and one from John Golding in Halifax. 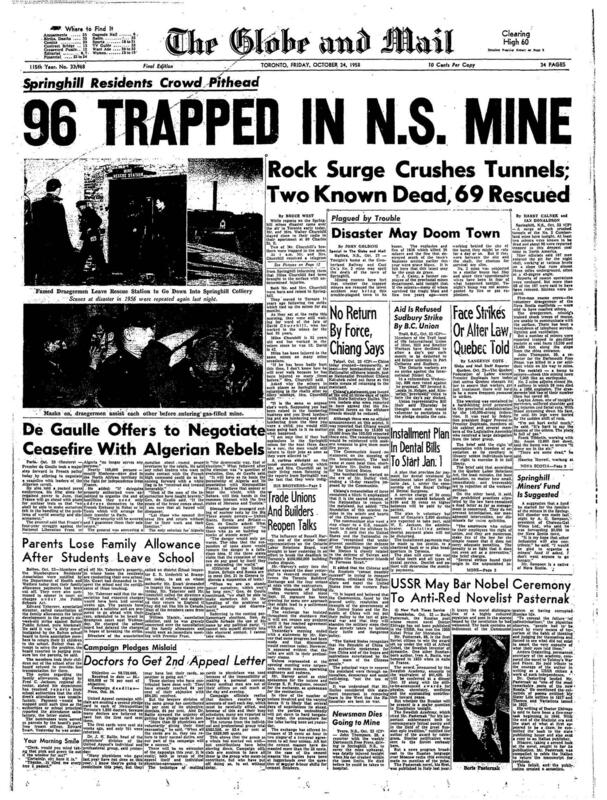 Images courtesy the Toronto Star and Globe and Mail archives. I seldom drop resnspoes, however after browsing through some of the remarks on Springhill Group Home : Facebook buys 650 AOL patents | News Center Springhill Group Home Loans. I do have a couple of questions for you if you don’t mind. Is it just me or does it look like like a few of these remarks come across like they are written by brain dead individuals? And, if you are posting on additional sites, I’d like to follow everything fresh you have to post. Would you make a list of every one of your public pages like your linkedin profile, Facebook page or twitter feed?